When You Need Clean that Really Means Clean – Then You Need Eco Cleaning On Your Team To Make a Difference! Our construction cleanup services can really help contractors who are wrapping up a building project and on the verge of turning possession of the site to the owner of the new premises. Our services mean that there’s no dirt around – because we’ll clean it all and leave the property looking just as you want it to – clean and tidy! While sub-contractors can’t help creating the mess, we are one of the few construction clean up companies that help them clean it all up! Our construction cleanup services include Pre and Post Construction Cleanups, Phase I – Rough Cleaning*; Phase II – Prep Cleaning*; and Phase III – Punch Cleanup, amongst a whole lot of others. When construction contractors have wrapped up a job, and are primed for project handover to the new owners, we’ll get involved. Our construction cleanup services will ensure that all seen and unseen areas of the site are cleared completely of dust, dirt and debris. As one of the leading construction cleanup companies in the business, construction project staff relies on us to clean their sites of all dirt and debris, leaving behind a clean and tidy looking site for the new owners to take possession. And we do it in a well-organized and timely fashion so that dust and dirt is nowhere to be seen! Once pre-requisites like framing, electrical and plumbing have been completed and inspected, our construction cleanup services teams should be called in to conduct Rough Cleaning. This cleaning may also take place prior to or following the completion of what’s popularly called the “dry stage”, which refers to drywall installation on ceilings and walls. During this stage of the cleaning process, construction cleanup companies remove trash and large debris, while also removing stickers from windows, mirrors and glass doors. The property will undergo a complete sweeping, followed by thorough vacuuming to ensure dust and dirt has been fully removed from the site. This phase of our construction cleanup services is a precursor for getting the site ready for other subs to come in for painting, cabinetry, flooring and fixture work. Most construction cleanup companies don’t accord the type of priority to site safety and cleanliness like we here at Eco Cleaning Services, Inc. do. That’s because we understand their importance to you. Our first order of business is the removal of stickers and labels from fixtures, appliances, cabinets, refrigerators and windows. As part of our construction cleanup services, we’ll then do a thorough wipe-down of baseboards, door frames, light fixtures, window ledges and interior windows. 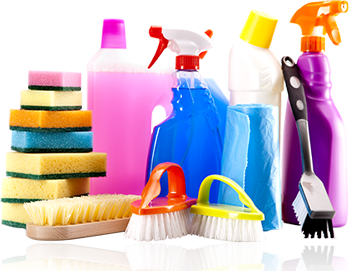 We’ll also ensure that all glass, mirrors and counter-top surfaces are cleaned. As one of the leading construction cleanup companies serving the industry, we then know how to get your site punch-list ready: By sweeping, vacuuming and mopping the entire premises so there’s no trace of dust, dirt or lagging debris. We bring a team mentality to our work, and that means working in close coordination with your own project management team, as well as synchronizing our schedules with those of other contractors and subs to ensure timely and thorough completion of the job. You’ll find our third phase cleanup, the Punch Clean process, is more thorough and meticulous than any of our peer construction cleanup companies that you may have worked with. By the time we’re done, your site will be more than ready for client viewing or even a grand opening. That’s our Eco Cleaning Services Inc. guarantee! Our exceptionally experienced crew of construction site cleaning professionals are always eager to go above and beyond to meet all of your needs – because that’s the Eco Cleaning way! And wherever necessary, we’ll accommodate your schedule so that your project is completed on time in line with your expectations. As part of our construction cleanup services, we’ll do whatever it takes to ensure your client moves into the property on time, or that your launch dates are met. This phase of our construction cleanup services is aimed at making your site move-in ready. And that means giving the entire premises its final cleaning, including removing dust, dirt and debris that site crews may have left behind; washing walls and surfaces, and high-dusting all rooms, including pipes, ceilings, light fixtures, vents and duct work. And unlike other construction cleanup companies, we go even further. We’ll sweep floors, clean interior windows, vacuum carpets, mop floors and address any remaining dust that may be left behind. Sinks, showers, bathtubs and commodes will be washed and cleaned; fixtures like stainless steel fittings and mirrors will be polished; and bathroom and kitchen walls will be washed, leaving the entire site spotless and clean. Only once all of these construction cleanup services have been delivered will our cleaning assignment be declared completed – and not before! Unlike many generalist construction cleanup companies around, Eco Cleaning Services, Inc. is a specialist that offers high-quality services to Residential, Industrial and Commercial construction sites across Toronto, Oakville, Mississauga, Brampton, Vaughn, Burlington, Etobicoke and beyond. Our construction cleanup services teams are extremely flexible, working cooperatively with site project staff to ensure jobs are completed on time and with high quality results. To learn more about specialized Post Construction cleanup services that we offer, please call us at (416) 871-0905, or go online and fill out our simple Construction Cleanup Estimate form. We’ll schedule a FREE estimate tailored just for you. As one of the leading construction cleanup companies that specialize in this business, our objective is always to provide customized cleaning solutions that meet your specific needs. So feel free to call us or go online and schedule a Construction Jobsite Cleanup Quote. It’s FREE, and there are no obligations whatsoever. We’ll do a walkthrough of your facility, and offer you a personalized janitorial and cleaning service quote specially designed for you. We are a full-service construction cleanup services company that provides a wide range of Facilities Maintenance services across Toronto, Oakville, Mississauga, Brampton, Vaughn , Burlington, Etobicoke, Niagra Falls, Burlington, St. Catharines, Hamilton, Welland, Stoney Creek, Grimsby.